Right on activity in the territory Rockal and Bir Tawil, then other planet’s in the Universe as the territory of the Federal Government of Diamond's Imperium, and the possibility of collaboration to ensure civilizing structures and the development of early civilization colonies through global collaboration Outsourcing Corporation’s and agencies, with The Corporate Colonies of The Corporatocracy Government and The National Movement’s for Liberty. The agreement provides for the right activities and setting up their own offices in the territories of the Imperium of Diamond's for any offshore corporation’s and agencies throughout the world, therefore the right to promote the development of civilizational character of that area political norm, building a civilization market’s and business network’s with the ability to expand international market’s and trade cooperation across the world and in the interest’s of activities in the Bir Tawil, Rockal, and the territory of the other planet’s in the Universe with the registry as a territory Imperium of Diamond's activity with the permission of the Global association of offshore corporation’s. Therefore, offshoring corporation’s and agencies have the right to establish cooperation together with the King of the country Imperium of Diamond's thus ensuring activity in the form of starting and running many other corporation’s and firm’s, legal association’s and active department’s of commercial and legal nature in the field of industry, agriculture, services, science , education and health services and basic security. The King of The Imperium of Diamond's and currently own’s the right to cancel the proposal for the development or creation of some corporation’s if such activity formation of corporation’s could be contrary to the principle of stability of market’s and business structure. Free move, open new civilization. Thus arises and the Bank that will provide eligible client’s to create Anonymous financial account’s at the Bank, and client’s range from all over the world, so in the interest of agreement’s first development cycle as a tax haven. First Bank will be guided through the league Global Multi Offshoring Cooperation, association therefore has the right to establish other form’s of International relation’s and relation’s with other government’s in countries around the world and expand it’s territory. Offshoring Corporation’s are gaining the opportunity to use such form’s of cooperation as the Global Open Center of the territory with the permission of contact for planning global business activities, among other offshore corporation’s and agencies, so the ability to develop a global intelligence cooperation in the rhythm and the ability to utilize for developing it’s own range common civilizing forces. The King of the Federal government Imperium of Diamond's confirm’s on it’s own intention plan and project’s to establish at least a few ten’s of milion’s of business and active corporation’s and businesses that will be in the form of leadership OffShoring corporation’s and legally register government’s Imperium of Diamond's, or by other form’s needed civilizational situation and joint agreement’s. 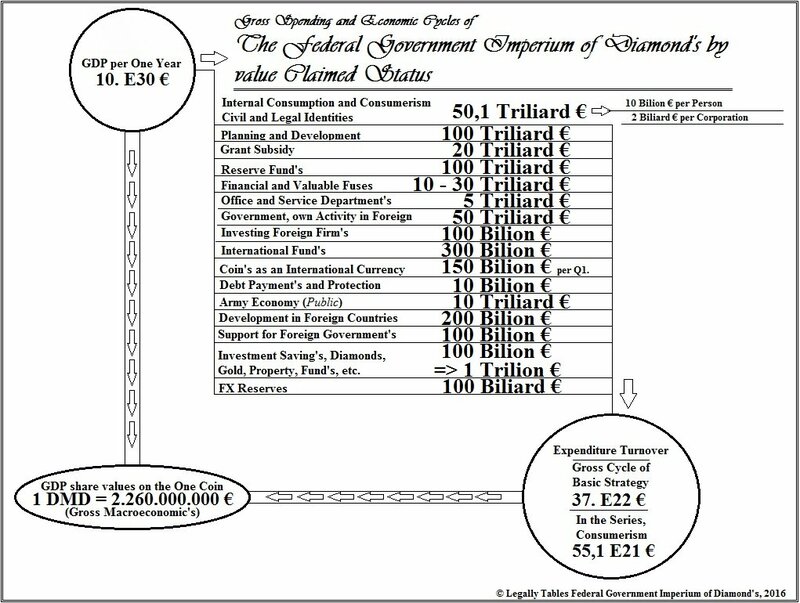 The King of The Federal government Imperium of Diamond's legaly confirm’s that his ability is to create more than one Miliard corporation in the nature of a civilization market’s and business network’s. OffShoring corporation’s that own the right to make a claim for increased cooperation and the opening of other corporation’s at it’s destination, in the interest of request’s from foreign client’s and also through the dimension stability of civilization market’s and the economy, and of natural progression for the development of civilization and such expansion. OffShoring Corporation therefore own’s an obligation to carry out cooperation with other corporation’s that come with an interest in establishing The Corporate Colonies in order to create global collaboration Corporation for the possible development Government of The Corporatocracy in other Cosmic territories of Super galaxy group’s and a future civilization as The Corporatocracy as federal membership in the government Imperium of Diamond's. This mean’s that Offshoring Corporation own’s a large advantage in term’s of enabling global collaboration with trader’s around the world and therefore the possibility to expand it’s own view of the global economy, policy, management, and value market forces. OffShoring corporation’s have to create your own agreement in the interest’s of foreign activities and against the use of corporate relation’s for the creation of additional branches and sales activities worldwide. The King of The Federal government Imperium of Diamond's will promote form’s of cooperation and suggest’s many form’s of cooperation for the development of other countries abroad in the area around the world. OffShoring corporation’s and agencies have the right to establish their own activities also in the interest direction of the second performance as a member of the Government Corporatocracy. Corporatocracy is open to all business and commercial entity in the world, development project for cooperation in interest of 1.000.000.000.000.000.000 planet’s in Universe. Offshoring Corporation’s and other Corporate Colonies are jointly entitled to the creation and exploitation of colonies Imperium of Diamond's in the interest of creating it’s own private civilization’s on other planet’s, and thus the volume expansion of the Federal government Imperium of Diamond's by other entities in the federation. The ID’s Declared Right’s for the establishment of another Territorial Subject of Civilization on behalf of the federal government as a separate and Offshoring corporation Agency, the law has to exploit every offshoring corporation’s and agencies. Today, in territory of The Rockal Clif, Bir Tawil and other planet’s in Universe, Offshore corporation’s and agencies are gaining the right to management and performance management of government department’s, the fundamental unit of the Bank, the creation of co-operation Administration for ministerial office, for the fiscal authorities and also the Office statistic’s, more other department’s. Part legally contracted crowd may be granted as a right for the dissemination of International communication and cooperation between the government’s, shared political and economic relation’s. All activities are registered in the interest of economy of Diamond's Imperium, therefore, always with full assurance of payment for all effort’s even without the application of full earning’s capability for reimbursement of agreed activities. Registered activity is a step to strengthen the country's GDP and therefore the workforce paid through the Central Bank of the Federation. Each offshoring corporations and the agency get’s free entrance gift of a corporate ship’s, automobiles, aircraft, yacht’s, orbital ship’s, boat’s travel between planet’s currently own’s the castle as headquarter’s for the corporation or agency. Input possession’s are awarded at the time capable of functioning civilization and productiveness. This creates a right to collaborate on the development of civilization in the interest of any offshoring corporation’s and agencies from around the world. So, today, as the King of The Federal government Imperium of Diamond's also asking for government support and opportunities for joint activities through global cooperation of OffShoring Corporation’s for the possibility to establish conferences and communication’s activities worldwide and earning cultural event’s and conferences to allow contact with other corporation’s in the whole and the world around them. For the opportunity to meet with the King of The Federal government's Imperium Diamond’s it is advantageous to support the creation of additional conference today on the territory of Europe and near. Offshoring Corporation’s and Agencies may welcome the possibility of immediate contact and communication in common on other project’s, issues or for getting more information. The King and at the same time asking about the possibility of realization of a common communication’s contact for the possibility of establishing other retail corporation’s of The King, The Royal Consortium abroad on the territory of countries in Europe, Africa, America, Asia and Australia, thus establishing some corporation’s through legal cooperation of OffShoring corporation’s and agencies, as well as the management of these corporation’s and businesses. In any case, the Federal government Imperium of Diamond's are always very Grateful for any form of our cooperation and possibilities for our common future and development. Develop is important, so is the determination of the value of our future generation’s of mankind and global stability, policies and market’s. Thank you and Happy Days. 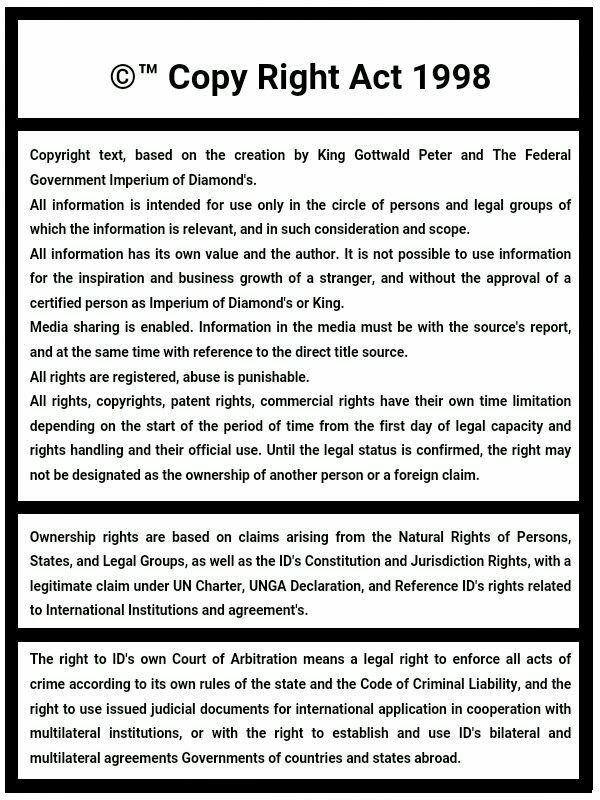 Activities in the form of these rights and values ​​are based with the register of copyright’s and commercial right’s through The Federal government Imperium of Diamond's. The META-National Business in Plan of Activation and profit of 10,000,000,000 € for The Acount Manager per first month. The META-National Business in Plan of Activation and profit of 10,000,000,000 € for The Acount Manager per first month. The Contractor is Represent for Business connection between Private Security Personell's. The Business of partnershiop between the Conglomeration Companies in plan of building New Trade Network's in The ID's territories and found the ID's Manager Corporate Infrastructure. In the world exist more than 800 Conglomeration's, we are have capacity for every one Conglomeration on the world. Special META-National Conglomeration, Consortium of Electro Technologic Companies, active as one corporation with own source of material, industries, and marketer's, the company have own internal trades and opportunities of development, own projekt's building. First level of Society value is 1,000,000,000,000 € per start, increased from only Contract connection. The Territory of the Federation is legally open to the possibility of establishing business and institutional activities as a Business Entity for Business Management Services and Administration. The right to perform this administration service has only a legal entity registered in the territory of the Federation and in accordance with the distinction between the International border between states. Each federally active or foreign trading group for the management of business administration activities therefore has the right to establish its own trading headquarters in the federal territory to support federations and foreign traders to their ability to set up business activities in the federal territory or to manage active business territory of the Federation. A commercial entity for the administration of business administration services has the right to establish in the territory of the Federation any person who is a certified profession of business analyst, business organizer, economist, lawyer or legal expert and a trader with intelligent level of responsible management of Management Service Corporation, Companies and Agencies for Business Management Administration, or all Banks active and legally registered in the Federation. and management of performance management of business contracts between Business entities in the view of authorization of Administration Services only in respect of points of contractual obligations between business entities. The Federally Active Institution or Business Entity as a Business Management Service Company collectively furthermore establish institutional centralization through a Procurature Office as a joint office network with the central seat of the Federal Centralization Institution with a legal status as a incorporated company as the joint Business Trades Department for Business Management Administration Board of Directors for the Management of the Administration as a joint office active in the management of the joint development logistics for the purpose of establishing new business entities in the federal territory in the initial assessment of the state trading networks and suitable opportunities for their development according to the application of the appropriate strategy and plan of interest the logistic form of the geography of federal and economic markets. The Council of Agencies for Management Administration for administration of Business logistics and planning of business markets, networking strategies for new corporations, and joint logistics planning with federal authorities and institutions to enable interactive market development to meet the needs of federation and strategic interests. The joint logistics department of commercial entities such as the Council of Agencies for the Management of the Administration Services to the Business Enterprises and also its own right to jointly initiate the organization of business activities of new corporations in the territory of the foreign state within the scope of its own International network of its Business Unit for Management of Administration Services owning, acting on behalf of the Federation's legal business entity, the federal institution, the citizen of the federation, the federation government, or in the form of ownership and representation only by the Business Agency for Business Management Service and for the purpose of its strategic interest, thereby establishing business cooperation of Federation with the States. The Council of Agencies of the Management Administration Services has the right to establish second business premises in the territory of foreign countries, thereby expanding international trade cooperation between states and traders with a global form of market coordination. Thus, the joint logistic unit has the right to jointly initiate, organize the business activities of new corporations within the Federation territory, as a business corporation registry as owned by a foreign national, a foreign institution, a foreign trade entity, a government, or in the form of ownership and representation by a Business Management Agency The service. A commercial entity in the Administrative Service from the Business Subject for Management Administration of Business Companies, therefore establishes its own position as the principal representative of a Business Entity in its Administration Registry, and the Registered Owner of Federal or Foreign Origin can remains anonymous to the public. The agency as a Business Trader for Business Management Services therefore maintains the register of Business Owners' for Business Subjects in the Administration Service by the Agency as a Business Trader for Business Management Services, establishing its own second impartial authority in a private position, serving as a notary with a single right of register of real names of persons their status in the ownership of the business entity's rights in Management Administration by the Agency as a Business Entity for Business Management Services. The Agency as a Business Subject for Business Management services also uses a private office for the purpose of centralizing logistics of business and development strategies, allowing its own silent position of business plans and providing immunity against the risk of spying infiltration by another foreign entity into the Agency's office as a Business Entity for Business Manement Services. The Agency as a Business Trader for Business Services has a duty to cooperate with the Council of Business Subjects for the Management Administration Services for Business Subjects, thereby utilizing common logistics with Operations departments that consist of other forms of business category services active in the Federation. Other forms of the Council of Logistic Services in the form of Business Entities arising from the development of Federal Markets and Logistics, suitable for strategic use in the development of business activities of the Federation. Foreign business entities of the relevant categories, as business entities without business register in the federal territory, can participate in the form of information and operational support only as a second-level entity allowing only consultations and performance of business cooperation between business entities under administration. The Council of Agencies, as a body of Business Administration Management Services, as well as independent Agencies, have the right to collect funds from the establishment of a corporation and firm, as well as managing the management of trade and business services, according to the capital values ​​of the business service position in the federal market, prepaid activation payment, or in the case of a subsequent payment from the profits of a business entity under management. 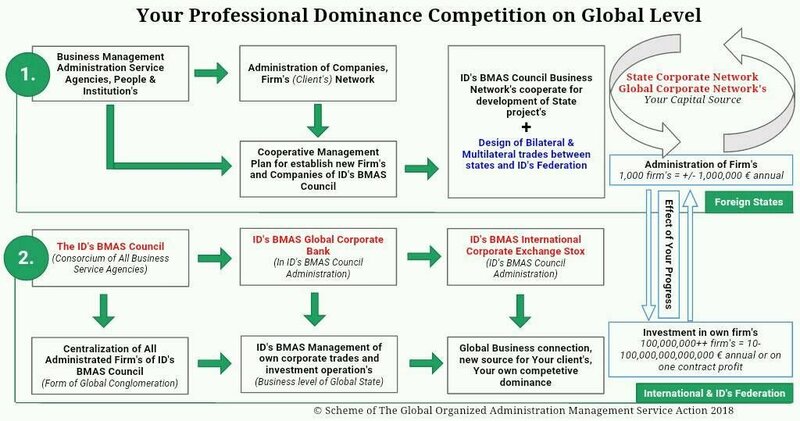 Each individual Business Management service entity, commercially active in cooperation with the Council of Agencies of Business Administration Management Services, therefore owns the right to self-payment of its share of the joint profits, responsibly based on the result of the Business Unit for the Management of the Administration Service, share, and a claim for profit in the resulting building. The Council of Business Administration Management Companies has the right to use joint capital from the profits of the Council of Agencies of Administration Services and the values ​​of registered business projects in order to secure the function of the joint Bank. The Common Bank of Federal Agencies is an Institution based on the status of the Headquarters of the Federation, and on these issues represented by the Federation Government in the performance of the Administrative Co-operation with the General Board of the Council of Agencies. The Federation government supports cooperation with the Business Management Service Council of Agencies, thereby creating common interests of development cooperation and global market planning. The Government of the Federation has the right to scrutinize the list of persons using the Administrative Agencies' commercial offers and thereby to block or limit the rights of persons and entities that are labeled by the Federal Sanctions or the obligation of special principles and the prevention of organized crime and fraud. The Council of Directors for the Management of the Administration services has the duty to ensure the function of its own team of Information Representation, for the purpose of exercising permanent organized contact with the Trade Offices of the Federation, the Ministry, the Parliamentary Chamber, the Government Logistic Authorities, the Senate and the Royal Council. The Council of Agencies of the Management Administration Services has the right to propose the commercial development of the Federal Market and Economy Networks as a draft act as a trading information exchange or to submit its own draft voting rights to support the growth of the state by using regular communication with the Federation's Trade Offices, governmental logistics offices, the Senate, and the Royal Council. Every corporation, companies and business from around the world have all right to create their own business and productive branches which will be based in the territories of The Federation. Every trader, company, corporation always own the right to use protection and justice through the Federal court's why the option to create a common activity that mean defending the right's, claim's and own property and justice. Any foreign business entity in the federal territory owns the same business terms as a commercial entity from the Imperium of Diamond's if the foreign entity is active under such statutes. Each foreign business entity has the right to request the establishment of business activities in the Federation's territory and thereby to acquire the status of such statute and right of Business Activity if the Federation's offices approve the application. The Corporation and the company's own and are entitled to use in case of registration of it's own trademark's through the registration authority of the Federal government, Federal Business office. Every company and own's the right to register their own copyright's, patent's, trade law and other wealthy values. Every product produced or imported must be registered in offices of Federation. Every company and the right to form their own stock market's and establish and develop cooperation with other companies, own business and trade strategies, rights of own development in accordance of Federal Law. A foreign-owned corporation owns the right to use its own investment capital to develop new branches within the Federation, or to use the federation's business network, or to establish its own contractual sales network for an act of business management active as autonomous development of a new business branch as an ID's business subject, between the parties of the Federation and the origin from abroad. Branch companies and owner's have the right to obtain grant's for the development of businesses and corporation's, and grant's from the Federal Government, in term's of finance or contract's generated trade and cooperation. The Federal government therefore cooperatively to ensure the support development logistic of each entity firm's, corporation's, and their ability to exercise corporation's and companies in the interest of the best option's when equivalent vision of Management for civilization of Federation and company. The Assembly of trader's, companies, corporation's can be used to create common agreement's on the transformation of companies and corporation's, by corporation's to create second, third new firms, companies or concorses in new additional business categories that are running permission jurisdiction of the federal government. Every business entity from abroad, in the event of obtaining a Federal License, to establish business activities in the territory of the Federation, therefore establishes its own second trading venue of a foreign business entity in the Federation, with the possibility of a commercial corporation and the direct purpose of establishing a Headquarters center or Second Central Headquarters entity on the territory of the Federation. Activities of companies and corporation's must be in the interest of matter Federal civilization, so in order to maintain stability. Management for Business Subject own's the obligation to respect the right's of citizen's of the Federation, in order to respect democratic nation in an effort to appeal the project due for breach of the landscape values of the are and federation, ecology, health, values and possession's, liberties and other values claimed by federal citizen's. The business subjects must use the representative persons of Federation citizenship or become a citizen of the Federation, a commercially active person registered by the Federation, or may use the Certified Agency Agents in the federation so that its business branch in the federation can be represented and represented in business and planning. A person other than the Federal citizen or the Agency has no right to create a representation of a business entity active in the Federation. If a representative of a business entity is not registered as a citizen of a federation, the representative must be registered as a commercially active person in the territory of the Federation and according to such statutes. The Federal government own demand's for support logistic of decision's on the management system between corporation's and firm's, capitaly regulate prices and taxes, the value of ratification of services according capital trade and development strategy, determine the value of the tax, fees and the ways of the market and the legal principles of the federation. So even distribution of branches and their zones of activity. The Federal government but it's own right for it's publication obligation's standardization policy activities, budget and value of payment's, limited working hour's, the right to process the application of the product on the market and decision's on the duties of the process to confirm the safety of the product and it's safe use, storage time decision categorization of product decision's on the right's of dealer's in the just proportion, normalization and thus ensure the stability function of civilization in all needs and accordance. The Federal government why announces entitled to establish cooperation between companies and corporation's in the interest of their demand's for activity that and also mean's the ability to create a system that will ensure the application of any corporate and business activities according to available and usable option's and therefore the federal government always creates a system to ensure the implementation of all activities between corporation's and firm's according to their interest in the market. The Second Business Headquarters serves for its own business communications and official representation within the Federation, and provides commercial guarantees to a commercial entity in the course of its business activities in the Federation, but also for the purpose of commercial cooperation with the Federation's government, thereby enabling active development according to civilization logistics. In the event that business guarantees are not met, then the Second Business Registry is responsible for non-compliance. The second trading venue must thus limit its own market horizons according to the commercial guarantee budget strategy when applying the strategy of the legal strategy of the commercial contracts strategy and their use in the territory of the Federation. If a foreign corporation exceeds the trade budget by the level of the commercial guarantee capability at the value of the Second Depositary, the guarantor becomes the official address of the Foreign Trade Registry as the entity that must provisionally issue a guarantee of the availability of the warranty claim and the ability of such enforceability. Trader's Guarantee Foreign persons in the name of Federal jurisdiction may be federal courts enforced in any value of currency, finance or commodities, as determined by the court. Business Entity from abroad owns the registry of its second business establishment as a foreign entity, or the creation of an independent second headquarters as an entity which is a separate official group of origin from the Federation and own Head quartier. The right of foreign traders, in the case of their interest in setting up their new business headquarters in the ID's federation, creates the obligation to register the address of the second headquarters as a branch in the Federation. If a foreign person uses the rights to establish his second business establishment in the ID's federation, this business entity becomes a legal entity in the format of ID's Legal Commercial Institution. If a foreign person makes use of such a right to establish a second commercial or head office in the territory of the ID's Federation, the act must be applied in accordance with federal law procedures or, in the case of the IDs of the International Treaties that govern such a legal procedure. Every company and corporation own's entitled to use the security system Trial Safety Office, in order to ensure full safety of all activities, justice and right's. This may, at the request of companies and corporation's, be controlled police investigation's, court proceeding's and activities Agreement's among other corporation's. Every company and own's the right to require the actual claim's of justice through the Federal Court's of Federation, and in case if the court does not the just verdict, then the company and own's the entitlement to make the request for the examination of the case by another court of Company Headquarter country. The court's of the Federal government, however, have the right to determine the authenticity of a foreign court nobles, and through examination of the matter before the Trial Safety Office and thus confirm the authenticity of the decision's of foreign court's. If the company and the corporation shall establish cooperation during situation's of federation under occupation, terrorism, and the company's own claim and the full right to establish foreign judicial prosecution or claim debt’s against terrorism if made situation will be a problem for the operation of the development branch and the establishment of the shop's in the size of territories and jurisdiction's of Federation. How You can search a New Client ? - Special oportunity for Business Administration in cooperation with comercial Security sector. Open oportunity for development Business site of more than 1,000,000 companies ! Level of real state ! The Primary project for Development according Intelligence of the Industry on autonomous Inter-source development, Start Price 500 000 € developed country. Second progress, level of development Cosmic Ship's in economical values for 6,000,000,000,000 €'s. In case if any other country's government and owned or movement is interested for the notification of stopping your activities, then we need to emphasize that our activities are not within the scope of its jurisdiction and will therefore be repeatedly prompted gate as attempted terrorism by means of threats. There is no any rule or entitlement rights and political, commercial and or other nature which means the possibility of limiting and blocking our activities. Our activities are free and thus in the interest of our jurisdiction. The other person has no rights to opposition against any form of opposition will be recorded and presented before the state courts, constitutional courts and subsequently rerouted before the court of opposition parties. A person who carries out the opposition will therefore be punished as a criminal foreign State and will be stopped powers of the political, commercial and social activities because of efforts to abuse their own political, business and social rights or powers. Criminal, a terrorist, and therefore will be punished for disidenstvi and damaged the values ​​of their own country, at the same time damaging the values ​​abroad. Position without having territorial conflict with another country's government. Having no conflicting or terrorist political activities to International principles Common relationship. Keeping the registry of the population or similar values ​​of population character. Legal Values ​​of civilization or the format of the active civilization. Governmental Activities, declaration’s, jurisdiction Intelligence and Statement’s. So the title and status of independent government-deductible nature of justice mean’s according everyone legally court of the government of the country in the entire world. Membership in the United Nation’s organisation, the establishment of cooperation with other organization’s of International politic’s, security and diplomacy. WTO membership and the creation of additional form’s of cooperation with International trading corporation’s. Cooperation with the World Bank, extending cooperation to other bank’s in many countries around the world. Extension and confirmation of International Relation’s of common friendship between other government’s around the world. The unification of all government’s in the world through diplomatic cooperation. Mean activities for development in territories of The Rockall Clif and Bir Tawil. - Telecommunication technology, radar technology, telecommunication appliances. Internet and data sharing. - Manufacture of weapons and defensive means. - Raw materials, metals, chemicals, mining and production of raw materials laboratory. - Melting and casting, forming and machining of metal or other materials. - Construction of steel and metal structures. Boat building, yacht, aircraft, bus, or car. - Welding and cutting, acreage of material, processed planning. - Production of electrical cables and wiring. - Pipeline construction and installation, infrastructure or other networks. - Chemicals and other chemical technology or concentration, activity and logistics. - Production of chemical reactor or tools. - Consumer electronics, electronics, machinery and automation. - Insulation for interior / Astronautics and aqanautics. - Mathematical Intelligence physical forces of materials and technology, computer technology and other computational management. - Manufacturing employment suit, suits, special fabrics and textiles in particular, to the laboratory, also for insulation. - Heating and electronic stoker, high-temperature furnaces. - Security services and printing, private detective services. - Health assistance and supervision, ability to use laboratories for the detection of virus, bacteria and other choprob. - A subscription to a source of food, food processing and manufacturing. - Building materials and construction of the building. - Manufacture of medical materials, manufacture higienickych materials. - Manufacture of basic pharmaceuticals, medicines, serum and medical substances as well as raw materials. - Colonial Stock Exchange as a branch of the Bank. Insurance authorities arising from subsidies and from other taxes. - The production of coins and financial authorities. Colonies space station', space station's, to the opportunities and territory Rockal and Bir Tawil. Create the kind of civilizing colonies, territories or Rockal and Bir Tawil. In the same option is also used, for example Free International territory of The Orbital Line skype. - Result on management format of the first colony. - Composition of the corporation in a second format will be created through collaboration between corporations in the first colony, or through cooperation from foreign corporations and their composition. - The full development of the bank branches and trading exchanges. - Full emergence of deputy minister office. - Geographically development and the full emergence of laboratory work. - Full-featured development of automated industry. - The development of mining and processing. - Processing of stone statues, stone buildings, production of artificial or other stone, concrete. - Logistic, Interactive Warehouses goods and materials. - TV, radio, Internet serwery, social and communication networks, data centers and the media. - Vnitrni agriculture, water laboratory nurseries, laboratories in the interests of chemicals and fertilizers. - Genetic engineering, modification, biochemistry, pharmaceuticals, biotechnology, healthcare. - Processed food at a, prekup food and its production for its use and resale. - Automotive, aerospace, industrial machinery, robotics, weapons, transports, another form of heavy industry. - Computers, supercomputers, programming, production and processing of data centers, computer circuits and software. - Large buildings, civil engineering, building design, construction. - Laboratory work, analysis and research, logistics and cooperation. - Farm equipment and other machinery. - Cleaning services, cleaning machines. - Scientific equipment and technology, scientific and logistics management. - Meteorological satellites and technology. - Manufacturing of satellites and space technologies. - Infrastructural Planning, Technology and machines. - Manufacture of textiles, fabrics and workmanship. - Breeding of industrial plants and wild animals, other forms of plantations for raw materials. - Security technology, fire extinguishers, alarms, locks atrezory, other safety equipment. - Turbines, engines, mechanical parts and components, ion engines, other types of engine. - Industrial technology and machinery engineering. - Botany, Biology, breeding and growing facilities. - Manufacture of plastics, rubber, natural rubber, carbon material, other forms of matter. - Transports pipelines, railway, train transport, railway transports, air transport between the planetary transports. - Mechanics, mechatronics, robotics, automation, tools and other. - Chemical reactors, generators, accessories. - Bacteriology, Baktericke material resources, baktericke generators. - Higienicke and cleaning, disinfecting products. Higienicka institutions, logistics and technology. - Forestry indoor, artificially silviculture. - Suits, robotic suits, skeletons and construction. - Atmospheric science, and biology. - Furniture and Interior Design. - Satellite manufacturing, satellites and radar, laser optics and technology. - Particle research and its applications to the emergence of technology, reactors particles. - Quantum math, mathematics rhythm reality. - Cybernetics, cloning cells or organs and other activities. - Space research and space technology. - Biological technologies and for the modernization of the body. - Any other other forms of engineering, science or economic activity. In goal of ID's civilizational stabilization, open Right's of Recompensation for each business corporation and firm in the world. maximal power in 1 000 000 000 000 € for Your State Economy site. The system of trade between businessmen from around the world, and ensuring the establishment of our global digital infrastructure, Intranet, using satellites and telecommunication towers, public Internet or using a laser connection of mobile telecommunications devices to satellites when the rights for the use of extraterritoriality and other legal conventions UNGA on diplomatic principles between states and their rights, and also by bilateral and multilateral ID's government with the other states. System new business step for the development of a joint profits is based on the development strategy of business cooperation between corporations for the construction and programming of virtual worlds and digital properties, the Corporation for the production of electronic and telecommunications equipment and computers, especially corporations that are based on the pursuit of cooperation in the Royal Consortium Imperium of Diamond's. Trading profit project for our financial fund, materials, engineering and intelligence capability for the production of technologies created with the help of legal agreements between traders with the intention to develop a global system of 3D virtual social networks and media like digital server accessible over the internet or on a new 3D net. System 3D virtual social networks according to plan Imperium of Diamond's is based on the ability to create technologies that will be successful in international markets, while certainly large and strategic financial gain to the achievement of security for our goals. Business Corporation with us will be signed development agreements on trade cooperation under the strategic management of joint planning for the manufacture of satellites and light aircraft for salvaging the satellite at the orbital space planet Earth, our own technology, satellites and telecommunications system in accordance with the principles of international political and business rules. The main step is the establishment of data centers which will be stored in digital virtual reality programs over the Internet that is accessible to every registered users around the world. Data centers will serve as carriers of digital programs that mimic social system, information and media networks, the Internet, while a 3D virtual reality in the form now known computer games and worlds for gamers, ©The 3Dnet. Geometric space created from the virtual world, at fair graphics and the ability for real social contact, multiple virtual conferences, joint sporting events, use of recreation-level visits to trade virtual centers for bids textiles, art, shops with cars, stores with electronic and consumer products goods exchange, bank branches, educational institutions, concerts and musicals, the city health consultation, betting and sports lottery and betting offices, public appearances by famous comedians and musical artists, or, for example, centers of relaxation and community activities with the possibility of using virtual spaces for their own social and socializing with the ways of the media, socially and commercially developed, building new centers and thus promote economic growth, global digital civilization. Virtual spaces will be created as a real copies of our reall world and civilizations, cities and states, building and public centers, transport networks and infrastructure in the virtual world will be created also the center of agriculture and industry, factories for the production of cars, ships and planes, textile factories, electronics stores, production of construction materials and the possibility to develop the architecture and build new virtual buildings, skyscrapers, business centers and shopping centers, sports stadiums and cinema halls, opera halls, really and truly real form of an advanced civilization with a dynamic infrastructure. Hence arises market structure in our real world, a market which is based on the values ​​of the actual shape values ​​of dynamic civilizing the economy and the registration of gross domestic product with the number of population with a level of access for all persons in the world and current synchronization with digital people which are based on artificial intelligence. Therefore is such an average population in numbers despite the potential three miliard until ten miliard people who are active members of the digital economy. Project that can create financial gains at a level that surpasses the competitiveness of any country around the world, because such a business is up economically with much greater force than the whole world of The Earth. Therefore, one of the first steps in our logistics is the goal for the founding of the International Bank ID's virtual reality and digital financial markets, therefore, may be a step towards achieving the objective of fully developing our projects and creation of common infrastructure of our community communication and financial gains for our activities and work results. International Bank ID's virtual reality and digital financial markets will be sufficiently financially based on the ability of high financial guarantees and register their own project plans with business treaties for contacting other business corporations and companies doing business in the market of digital technologies and telecommunications, programming, virtual worlds programs. We therefore able to gain a lot of traders who want to benefit from our progress of business cooperation and opening common commercial contracts for the development of technological infrastructure of our digital world, antennas and digital transmitter technology, data centers and specialized centers for high-capacity operating activities, global infrastructure of satellite transmitters and satellites that they will be synchronized with special technologies for clients who want to join in our virtual world and use this world, together with the other people. Business Corporations immediately receive all the funds for their services, and our global network of virtual world can be fully active in quick time. We therefore can jointly establish well business corporations that are owned by the International Bank ID's virtual reality and digital financial markets or the Federal Government Imperium of Diamond's and business associations may therefore be active in management development strategic business plans that will develop the technology and structure of digital worlds and networks . Built business firms will be designed to develop technology at a level supercomputers, data centers and computing infrastructure, technology, data media, telecommunications and the Internet, together with further networks intranet and specialty telecommunications and virtual technologies, too quantum technology to calculate our reality and many options for this direction development on scale technological world. The target is to build a new global communications network which is based on a new level in the form of 3D-net © ® ™, advanced level of today's Internet and telecommunications. Therefore we can always good to know that our network of data centers and communication will always be based on full stability and success for our intranet and our freedom of communication in the legal development of our society, The International Law Intelligence Council. Our common goal is to organize for the purpose of creating a global infrastructure businesses 3D virtual world and making communication with the governments countries worldwide. Our strategy is to develop a new international center for multinationals ID's, or offshore centers, with quarteer our ID's International Bank for virtual reality and digital markets. We together will create steps for the development of new branches in diplomatic relations with the other countries governments and therefore the ability to own scope of jurisdiction in the territory of a foreign state. Our branches and the bank will therefore benefit of business cooperation that will strengthen the commercial strength and the currency of other countries using our bilateral and multilateral agreements on the common market, which will be a guarantee for foreign states in their stable standard financial currency and the strength of the economy without inflation, and the ability to develop our economy. Central owner of the economic relations of these virtual worlds are the Corporation for the operation and development of 3D virtual reality, artificial networks together with the Bank IDs for digital markets. That is why other governments are depending on our business cooperation and the need to ensure that our agreement on strategy, financial manipulation without the threat of inflation and the currency lost value economic dimensions of GDP. Our joint markets can be the basis for agreement on a common trade products and exchange resources for money is an investment development projects or contracts on joint financial fund which is used for the development of our civilizations and business interests of our party strategic partnership, and it is equally possible to develop our relations agreements as a form of ID's multy savings Bank for virtual reality with the possibility to impose financial gains for local banks in foreign branches and therefore strengthen the currency state government. Commercial Corporation for the management and administration activities of the 3D virtual world based on the foundations of the rights of claim for taxation of financial income of all clients who use the services of 3D digital world 15, 25, to for example, 35% of the direct gains on the activity of virtual markets and shops, it It is a theoretical financial dimension to the level of 60 000 000 000 000 € in the phase of global recovery, and soon with the ability to dynamic growth in financial strength gain over 300 000 000 000 000 €. Economy of interactive android intelligence virtual people is full owned be the Bank and Corporations for service management, therefore the Dymension of financial profit is in theoretical values of 500 000 000 000 000 €. These are values ​​which, in the interest of business collaboration are truly essential strategy for implementation of joint agreements for each government of the country in the entire world. Significant values ​​which have an extra benefit for investing in dynamic development of world civilization and the rise of values ​​maturity of all the states with the ability to ensure the development of civilization Imperium of Diamond's. Our main goal is to create the global economic associations of governments of countries that can benefit our joint investments and trade are to agree on a multilateral commitment to a common strategy and development of our civilization, economic and political alliance at the G20, G77, OECD, ASEAN and other similar business organizations it is the fact that we were able to level the digital world to build the same structure trade policy as well as the world trade Organization. Our goal is to promote throughout the world, the development of other civilizations and modern level. At the same time, the more users we can get that much bigger gains will be for our business center of the digital world. Therefore, our significant investment capability and technology to ensure the development of telecommunications and Internet networks throughout the world, our planet Earth, in Third World countries and territories of widespread land without any radio signal and communication technologies. Our industrial and commercial network of corporations, banks will be expanded sufficiently in the circuit telecommunication and technological level to ensure that new development for digital telecommunications and Internet infrastructure anywhere in the world, while the abilities and gain financial gains from new users of 3D virtual world, and therefore governments gain our development interests and telecommunication technology is fully free, with no obligation to pay direct state funding, or the option to subsequently negotiate the common market. For each country the government's high profits and big business opportunity. Future development of a 3D virtual technology will be focused on creating other central datacenter on space stations and the universal civilization of ships, real ships that can fly in space and attend distance beyond the range of our best observational skills radars and optics, more than 10 000 000 000 000 light-years from planet Earth. Therefore, business corporations that will support our development and common markets, traders can therefore benefit from great opportunities for the development of their markets at the level of other civilizations in the universe, even with options cooperation on the development of new advanced technologies that are important to the economy, politics and civilization of the future tense. According to today's technological intelligence Imperium of Diamonds is an option to extend the intelligence and dynamism of 3D virtual worlds and new civilizations on other planets in the universe, a civilization in special space stations. Imperium of Diamonds technology can ensure the creation of a special space-based telecommunications network at the same level of maturity as worthy of today's infrastructure radio networks on the planet Earth. We can use 3D-net communication between galaxies, with speed digital connections in the period of just a few short seconds. Today's radio signal is able to digitally and telecom combine two galaxies within about 14 years, but the technology Imperium of Diamonds can these positions connect in just a few short seconds, it is today one of the greatest achievements of mankind and move full ability to develop mutual civilizations on other planets in space. If successful, these activities and their defense in the interest of the just claims and legal rights, therefore the ability to create high-capacity infrastructure 3D net that creates a large financial gains and that means that the federal government Imperium of Diamonds in cooperation with IDs Bank for Virtual Worlds and Digital Markets can immediately apply in full to each active member of the International Law Intelligence Council. That is why for us, this step is the most important and vital for the development of our cooperation and the confidence to achieve good results. I am the Legal Represent, legal form of a value of over 7 500 000 000 000 000 000 000 (7,5 Triliard) number of ID's business corporations be legal form, and the economic value of over € 3 750 000 000 000 000 000 000 000 000 000 000 000 000 (3,75 Sextiliard €) standard. 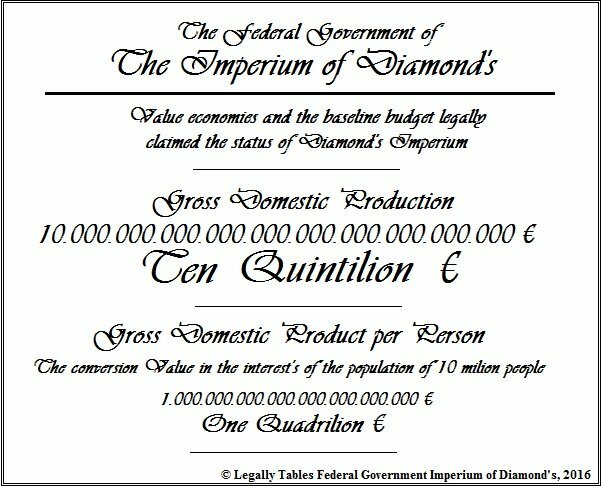 Legal registr of The Imperium of Diamond's population in capacity standartization who outstrip power of 3 000 000 000 000 000 000 000 people, and multy civilizational territories in the dimension of the 1 000 000 000 000 000 000 000 planet's in Universe as a active gross civilizational space. Today, the political situation, the Government of Imperium Diamonds under terrorist occupation, misinformation and blocking for development, all the claimed values ​​are fully legal without dispute in the interest of International political rules, and all rights for development. Therefore, I am King Gottwald Peter seeking intelligent people who are able to support the development of our shared Global infrastructure of organized networks Imperium of Diamonds policies with Extraterritorial status, and its own intent for custom stabilization of civilization, when principles and claims under the UN Charter, the UN General Assembly Declaration, universal principles. So I offer to each of You and for Your Dear Friends, new opportunities for a political career for Your own future on their own knowledge of the actual experience of life at the level of global politics and the real world of intelligence, advanced society our human race. I offer the possibility for You to work at the Office of the Imperium of Diamonds government the opportunity to work with the Global policy spheres, states, traders and public companies, development of the new worlds and human dimensions. Our goal is the stabilization of development, the new dimensions of the world, it is also Your personal advantage as the ability to subsequently advance to the significant level of politics and get fully free, dynamic and intelligent life. Our common success is best for You to step Your Life!